A Kurdish rebel group fighting for autonomy in south-east Turkey has declared a unilateral ceasefire with the government in Ankara. The Kurdistan Workers Party (PKK) truce is due to begin on Sunday and fighters will not use weapons unless fired upon. The announcement was made by a senior PKK leader, Murat Karayilan, from a base in northern Iraq. The PKK's conflict with Turkey has claimed more than 30,000 lives since it began in 1984. Speaking from his mountain hideout, Mr Karayilan said he hoped the decision would lead to renewed dialogue with the Turkish authorities. The BBC's correspondent in Baghdad, Jim Muir, says earlier unilateral ceasefires have been ignored by Turkey and have later lapsed. But he adds that the country is under pressure to tackle the PKK issue from both the US and the European Union, which Turkey wishes to join. The declaration came after the PKK's jailed leader, Abdullah Ocalan, called on Thursday for the organisation to seek a peaceful solution with Turkey. The Turkish government has previously said it will pursue the Kurdish militant group until it is eliminated or surrenders. On Friday, Turkish Prime Minister Recep Tayyip Erdogan rejected Ocalan's ceasefire call. Mr Erdogan said a truce was only possible between two states, describing the PKK as a "terrorist organisation". A spate of bomb attacks hit Turkey over the past month, some of them blamed on a group called the Kurdistan Freedom Falcons (Tak), regarded as an offshoot of the PKK. As violent attacks by the PKK have escalated in recent weeks, Turkey has been talking tougher than ever, even threatening military intervention in northern Iraq where the group has its bases, the BBC's Sarah Rainsford in Istanbul says. 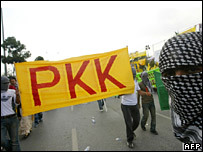 The PKK has been classed as a terror group by the European Union and the US, as well as by Turkish authorities.